I've had this book for several months, and finally have the time to fully explore it and make a shirt from one of the many patterns that are included as separate traceable sheets. Since I am not yet familiar with the fit of these patterns, my DH Roger will be my victim "fit model". 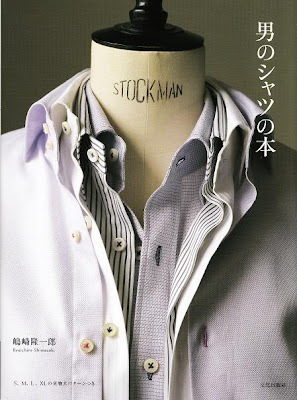 Of course, after I finish the shirt you will see it here along with a full review of this book. I may decide to do a step-by step series of blog posts, or at least a few posts about the making of the shirt during the construction process....so stay tuned. 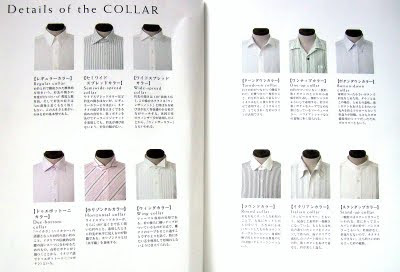 19 Full-Scaled Patterns of Men's Shirts for 4 Sizes. Oooohhhh - I would love more info about shirtmaking from you! I look forward to those posts. Looking forward to it! Wow...look at that diagonal stripe matching job. Wow! I'm excited about what we will be learning from you from what you learn from this book. Oooh is right. Looking forward to the first post and thanks for the link. Menswear patterns are even scarcer now than they were twenty years ago. Talk a bit about how you topstitch; where you sight, stitch length, foot and so on. My topstitching looks so-so, not impeccable like yours. Does the machine make a difference? Is your production machine industrial or a home machine? Again, thanks for the wonderful tutorials. Oh dear, I think I might need this! Oh my goodness - that looks totally intimidating!! I agree with Kathi--it does look intimidating! 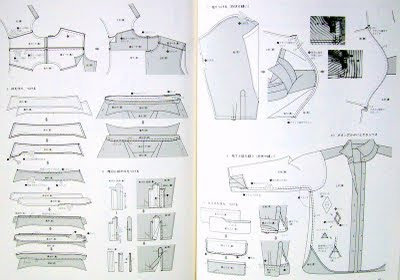 I look forward to your opinion about the fit and techniques in a Japanese book. Look forward to seeing how it comes together. I hope you address the size difference, 98 cm chest for the X large is still small for most.